I’m such a plant snob, once in a million years to my own detriment. Burgundy, black, blue, yellow, gold and red foliage is what turns my crank. I don’t forget about green, I simply undervalue it. This is such a beautiful, well behaved and simple to grow plant. I had a semi-tough spot in a landscape job in Golden Valley, Minnesota around six years ago. It was a fairly short bed, maybe nine feet long by four feet wide. It was prominent, a polite little corner bed up against the low fence hiding the mechanics of the adjacent swimming pool. Part sun was all, maybe four hours, so I needed something that would grow well, bloom, give me some fall color, and not grow too large. I planted three ‘Regent’ Serviceberries. A few weeks ago we were back at the property, doing a bit of pruning and replenishing their mulch. I walked into the pool area and lovely little ‘Regent’ was stealing the show. 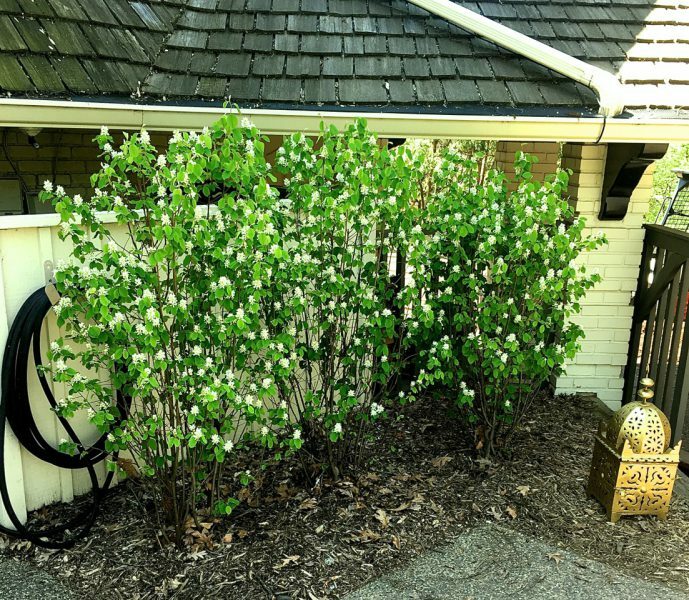 Light green, rounded leaves that flutter in wind set off clusters of pure white spring flowers. In full sun, flowering is more profuse, but with only four hours of afternoon sun the flowers are plentiful, followed in June by edible, sweet, purple-black fruit. In fall, leaves turn into a sultry combination of yellow to red. The plant is quite drought-tolerant once established. Even in full sun, ‘Regent’ is not a large shrub, maturing to around 4-6’ tall by 4-8’ wide. 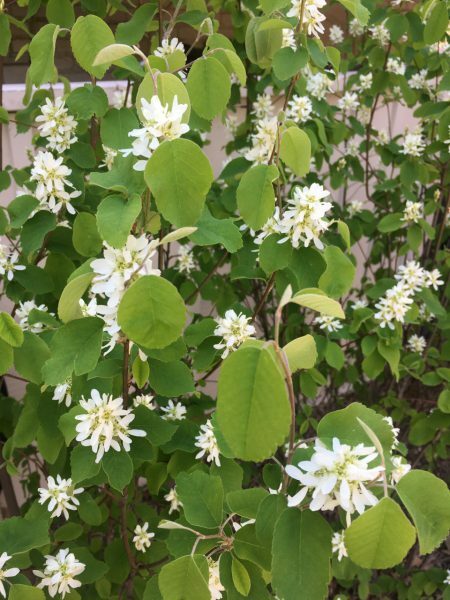 What I’ve added to my shrub knowledge is the fact that in less than full sun, such as a spot receiving morning sun/afternoon shade or vice-versa, it stays quite small, perhaps 4-5’ tall by 3-4’ wide. We’ve never pruned a branch from the three pictured. These three have maintained a nice, upright and narrow form on their own. So use it mid-border, in relatively narrow beds, it works well as a single, it’s good for naturalizing a large area when mixed with other shrubs.